The manuscript, titled “Modelling Co-Infection with Malaria and Lymphatic Filariasis,” is being published in PLOS Computational Biology. The findings indicate that mosquito co-infection is more prevalent than expected from single prevalence, meaning two parasites facilitate each other’s invasion. Looking for ways to address co-infection is vital to addressing the considerable public health burden of these major vector-borne diseases afflicting humans today. Since these two infections are transmitted by the same mosquito species, important questions about optimal control strategies in co-endemic regions need to be answered. The effect of the presence of each infection on the endemicity of the other leads to the need for comprehensive, reliable and dynamic pathogen co-infection modeling studies. Michael, who studies the spread and control of tropical infectious diseases, leads the team. Much of his research addresses the next generation of critical questions regarding the population ecology, epidemiology and control of neglected diseases and vector-borne diseases including malaria, dengue and lymphatic filariasis. Team members include Imperial College postdoctoral researcher Hannah Slater and Dr. Manoj Gambhir, both from the Department of Infectious Disease Epidemiology, and Dr. Paul E. Parham, currently at Bangor University in Wales. 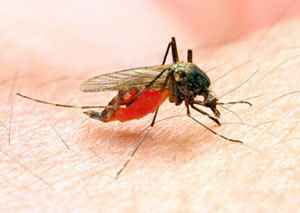 Malaria is a mosquito-borne infectious disease in humans and other animals. There are five forms of malaria, which can cause symptoms ranging from a headache to death. More than 1 million people, many of whom are children in Africa, die every year from the disease. Currently, there is no vaccine for malaria, though researchers around the world, including many at Notre Dame, are working on understanding the complexities and working toward vaccine development. Filarial worms, which reproduce and occupy the lymphatic system in humans, cause lymphatic filariasis, which can develop into elephantiasis. Early stages can go undetected for years. Once the damage to the lymphatic system is done, it cannot be reversed. The Eck Institute for Global Health is a University-wide enterprise that recognizes health as a fundamental human right and endeavors to promote research, training and service to advance health standards for all people, especially people in low and middle-income countries, who are disproportionately impacted by preventable diseases.